How to Give a Man a Simple Haircut. 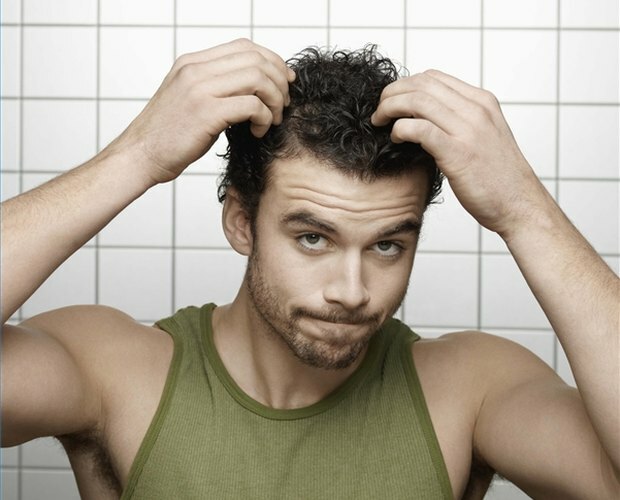 Most men want a simple, easy to maintain haircut. But, even a simple haircut can involve going to a barber every other week and paying up to $20. 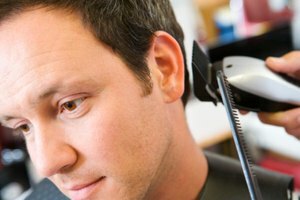 By using clippers to give a man a simple haircut you can keep him from being tied to the barber's chair. Purchase a set of hair clippers at your local store. Make sure the set has guide combs with varying lengths that you can use to give a simple crew cut or maintain other shorter men's haircuts. Pick a location that is easy to sweep up; bathrooms or kitchens with laminated floors work well. Or take a chair outside if your clippers are battery operated. Run the guide combs through the man's hair to determine the correct length. Attach the guide comb of the appropriate length to the clippers. Turn the clippers on and start cutting at the bottom of the hairline at his neck. Keep an even pressure on the clippers as you cut to ensure an even length. Cut at an even pace so you don't miss any hairs. Brush the cut hair off the clippers and comb through the man's hair periodically. This keeps the clippers from clogging and ensures that you are not missing any hairs. 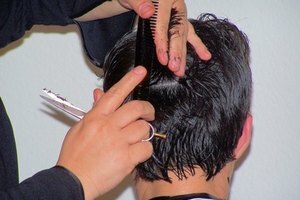 Remove the guide comb so you can carefully use the clippers to trim around the ears. Some hair clipper sets have guide combs designed specifically to trim around the ears. 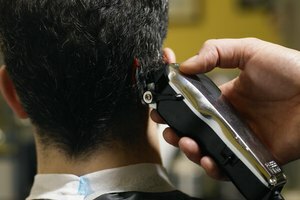 If yours does not, hold the clippers at an angle so that only five or so teeth are cutting the hair around his ear. Follow the curvature of the ear. Trim the hair around the neck. Without the guide comb, use the clippers to make a straight line following his natural hairline from ear to ear. Start at the ears and have the line meet up in the middle if you are worried about keeping it straight. Use the clippers to trim the back of his neck below the hairline. 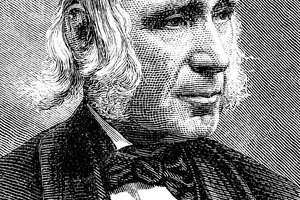 Comb through the man's hair and use the trimming scissors to cut any pesky remaining long hairs. Clean out the clippers and sweep up the floor. If you want to give a more tapered haircut, use multiple guide combs in varying lengths. Start cutting with the longest and work your way down. Use the oil provided in the hair clipper kit to keep your clippers running smooth. Use a barber's cape or slick rain jacket to keep the cut hair from clinging to his clothes.